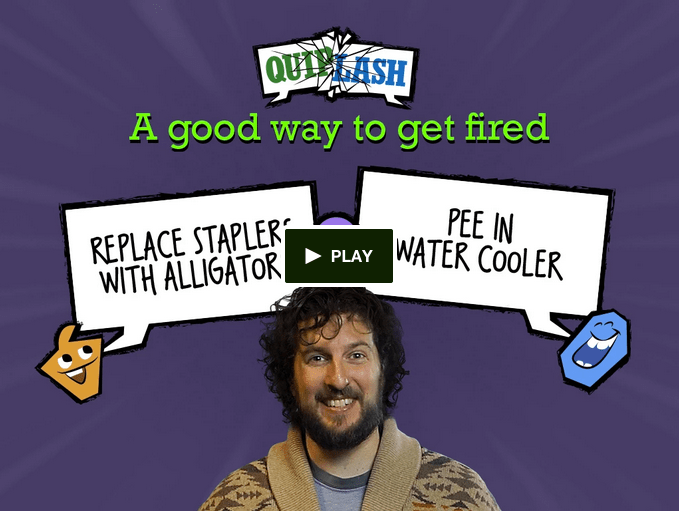 Jackbox Games, the studio known for the You Don’t Know Jack series has announced it’s newest party game, Quiplash. Quiplash is another fun party game with up to eight players all trying to create witty responses to open ended questions. Each player competes against each other and then a group vote decides best/funniest answers. It also has a fantastic twitch/livestream/community approach to it. Only one person actually needs to own the game to play. All other players can join in via phones, tablet, or internet-device as a controller. It also has a sort of spectator mode that allows people watching to vote for their favorite responses as well, changing the dynamic of the game and making it even that more fun. Surely a huge hit on Twitch, where live streaming this game for an audience would be tons of fun. It’s in development on Xbox One, PS4, PS4 and Steam (PC). The game needs some help though, and that’s where you come in. There’s a kickstarter going right now, in hopes to raise about $15k to help with production. Jackbox is only a 13 person team and the additional funding would allow them to give the game the time it needs to get it in our hands faster. Feel free to use the links below to get more information about this game, if you and your friends like party games I’d keep an eye on this one.